In the meantime, I will say that, based on the contents of Shingeki! Kyojin Chuugakkou, I would not consider myself a clean-freak. I like doing the dishes, taking out the garbage, and making sure my abode is relatively clean, but I have no qualms with keeping my room messy. If I had the three-dimensional maneuver gear that Mikasa, Eren, and the rest of the gang use to clean the massive walls at their junior high, however, I am positive that I would do a lot more cleaning than I already do. Until I get that gear, I can bide my time with Chuugakkou, a more-than-solid anime based on its more-than-popular relative. Chuugakkou stems from the famous Attack on Titan series. But this anime is no sequel, and it is technically no spin-off. Instead, Chuugakkou is a parody of Titan proportions. The premise loosely relates to the main series: Humans live among the Titans. But rather than practicing fighting mechanics and protecting their loved ones, they practice mathematics and protect their lunchboxes. The Titans disrupt their daily lives on occasion, but they are never a pressing issue – at least, to the extent that they are in the main series. For example, one episode has a female Titan falling in love with Jean. Another episode has a bunch of the Titans stealing the students’ cheeseburger stand. In reality, these two instances (and discounting Hange’s strange obsession with tickling Titans) showcase the Titans the most. Arguably, foregoing the Titans in favor of focusing on the classroom activities, the test of courage, and the student council presidential election may be a mistake. After all, the anime is poised as a parody of the main series. Meaning, no Titans equals no parody. Thankfully, Chuugakkou realizes the lack of Titans and pursues parodying the other parts of the main series. And it does so expertly. Many of the scenes mirror those in the main series – right down to the dialogue used. A nice example is in episode seven. Their year’s class is getting crushed in the sport’s day games. Mikasa, wanting to rally everyone, gives a goading speech, declaring how strong she is and how weak they are. Her speech matches the one she gives following a devastating event in the main series. Even Jean’s response – that Mikasa’s oratory skills need work – is the same. The anime does this scene-for-scene parody a lot. Episode twelve contains some advice from Levi to Eren about making decisions and relying either on oneself or one’s comrades (with accompanying desperation look from Petra). Episode ten has Marco giving an encouraging speech for Jean, a (similar) speech that he also gives in the main series following Armin’s risky plan. 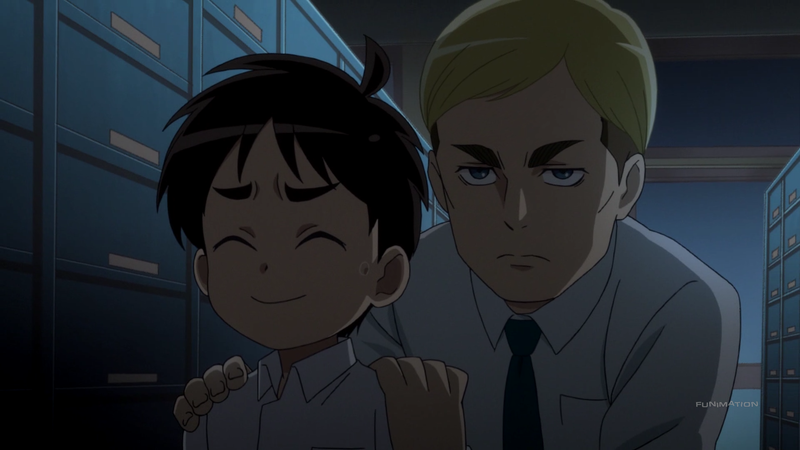 Episode eight has Erwin Smith standing behind Eren, Erwin’s hands on Eren’s shoulders and asking Eren what he sees. Same as he did in the main series. These are just a handful of examples. 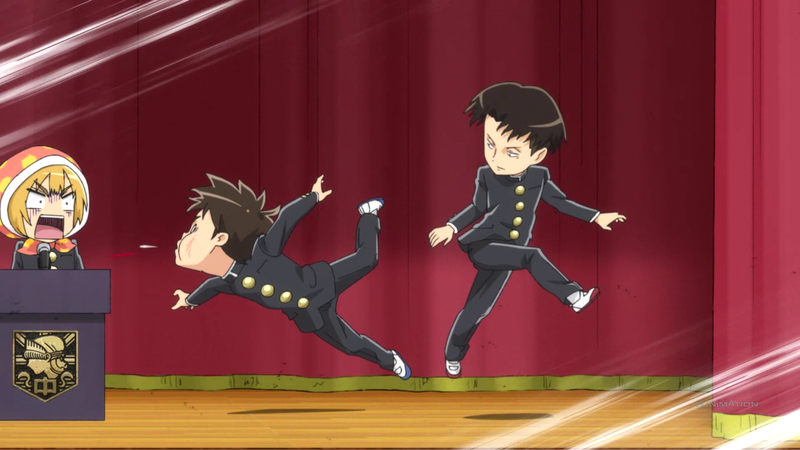 In reality, the amount of parody that goes on is substantial, indicating the anime’s tight focus throughout the entire season. This direct parodying is not always comedic, but it is nostalgic. At least, for those that have seen the main series. And, to be fair to Chuugakkou, that is the audience for this anime – fans of the Attack on Titan series. Armin dresses up as a poster girl (highlighting his effeminate appearance). Eren carries a key on his shoulder with glowing-green eyes (simultaneously referring to the boulder-carrying sequence and the all-important key to the basement). The anime states how almost inconceivable it would be to have broken three-dimensional maneuver gear (which, of course at this point, happens in the anime). Jokes, events, and tropes lost on non-main-series watchers, but, for those familiar with the series, become welcomed allusions. Chuugakkou also adds subtle parodic elements that boost the show’s comedy chops that much further. 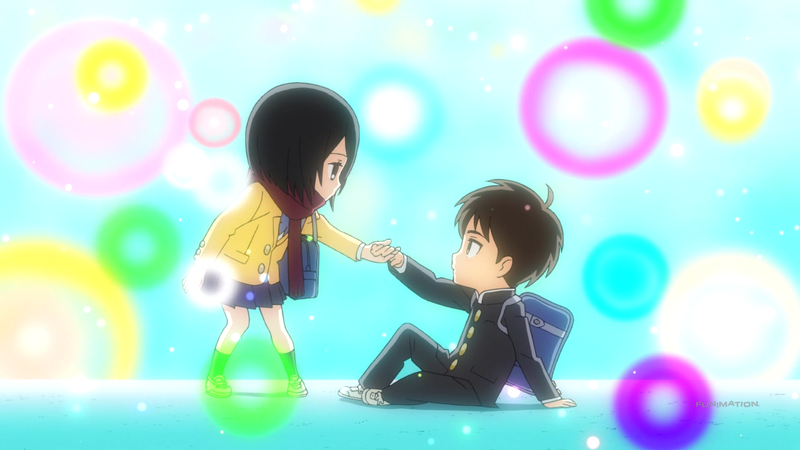 In the classroom, Mikasa’s drawing of Eren is, for a junior-high student, a literal work of art, joking about Mikasa’s perfection in everything she does. The masks and puppets that sometimes pop up match some of the iconic Titans. And Levi calling Hange “Abnormal” is a reference to the above and other, irregular Titans while also acting as an insult. Beyond the parody, the anime also includes other comedic bits. Background dialogue between Ymir and Krista about Eren incorrectly putting his name on a makeshift stamp. The characters nicely timing a repeat joke about Annie going to a Titan-and-human-mixed cram school. Mikasa unfazed by nearly every ridiculous event that happens around her. And that is the extent of the anime. Chuugakkou does not go for worthwhile themes, and it does not have to. 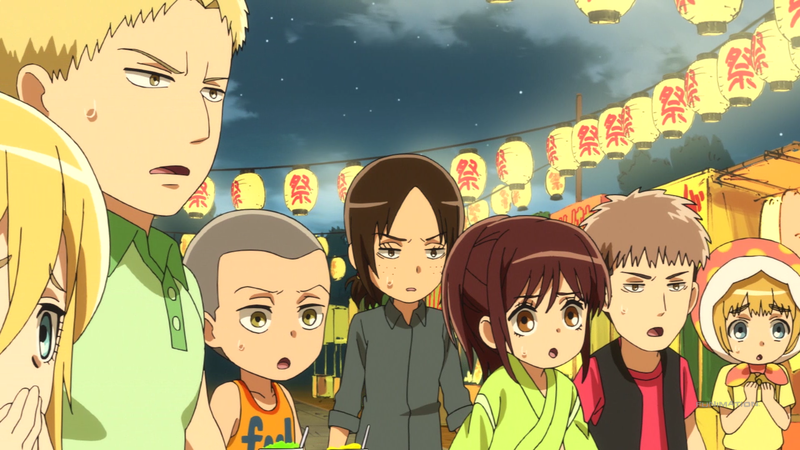 In its seventeen-minute episodes, the anime focuses purely on being a parodic, comedic experience. An experience that does almost everything right. Chuugakkou continues its strengths through its art and animation. Actual animation remains surprisingly high throughout most of the season. The exaggerated nature of the anime allows for a lot of character movement in the form of three-dimensional maneuver gear, cooking food, and running Titans. Even when characters are not doing much, their eyes, limbs, and other attachments move with fluidity. Artistically, however, the anime is a toss-up. On the one hand, the backgrounds and the places visited are bland. The school grounds do not invite many opportunities for gritty details or impressive-looking locations. On the other hand, the comedy and the parody does not stop. Characters wear silly expressions to elicit laughter, and specific scenes will literally be identical to those in the main series – frame-for-frame, perspective, and orientation. As for the character designs, they stay mostly true to their originals. “Mostly” because there are some changes. Mikasa’s eyes are more passive. 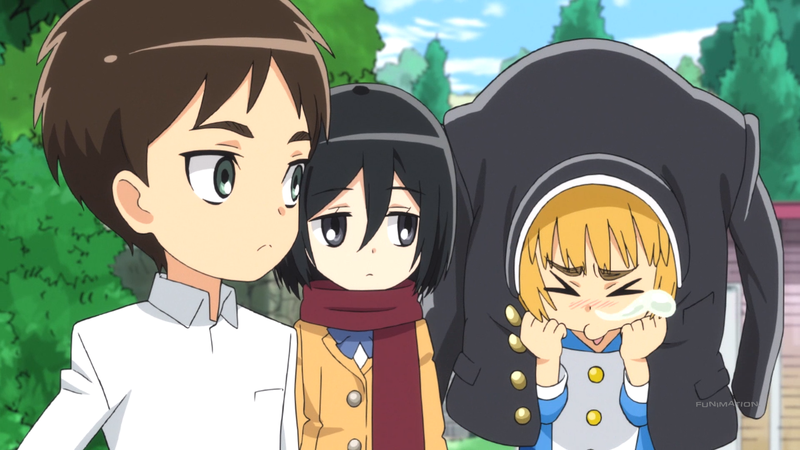 Armin wears a futon wrapped around his head. Hannes dons a janitor’s outfit. The thick, black lines, the attire of the corps, and the realness is exchanged for a small (pun intended) difference: The designs are all in miniature form. The characters have heads pretty much as big as their bodies, giving them all a silly look that boosts the comedy once again. Almost every character from the main series appears here in Chuugakkou. 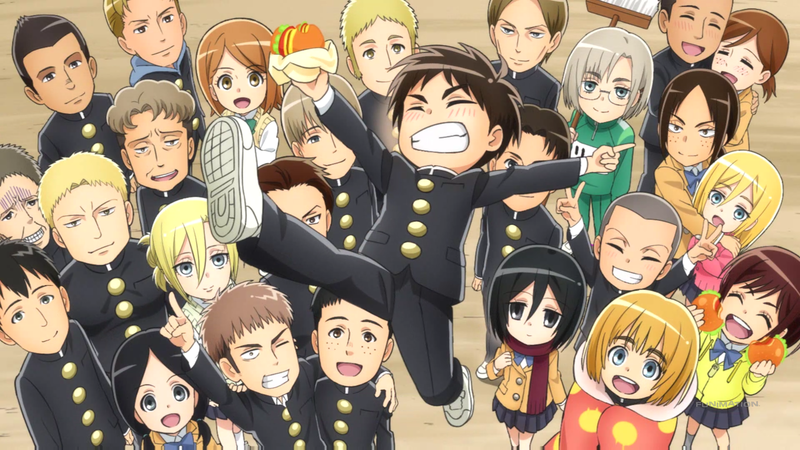 Naturally, the big three – Mikasa, Eren, and Armin – are front and center. Mikasa still has her unwavering devotion to Eren and her impossibly impeccable skills. Eren’s hatred for the Titans is as fervent as ever. And Armin’s baby behavior burns brightly. They are the same characters that the majority of the anime community have come to know and love. Many of the other characters are the same way, sticking to well-known tropes. Sasha loves food more than anything. Connie is somewhat dimwitted. Jean vies for popularity with the ladies. Oluo bites his tongue whenever he talks. Levi is scarily intimidating yet helpful. Ymir fawns and protects Krista who in turn continues being the nicest person imaginable (and a cutie to boot). Annie acts standoffish, Hange is slightly insane, and Hannah and Franz are madly in love. What gets lost in translation between the main series and Chuugakkou is the drama the cast experience. Without the looming threat of Titans, the potential loss of loved ones, and the intense interactions of the cast, the characters become only their aforementioned superficial traits. I.e., they lack depth. The result is a lot of repetition on the characters’ part. Mikasa does nothing more than say “Eren!” the whole time. Connie exists to say something slightly stupid sometimes. Oluo always bites his tongue whenever he appears. Now, the argument is that this repetitive behavior is yet another parodic element of Chuugakkou because the main series takes this route with its characters as well. The argument does not work, however, for two reasons. One, only two characters are as repetitive here as they are in the main series: Mikasa and Eren. The majority of Mikasa’s dialogue in the main series includes Eren’s name, and, for Eren, his dialogue is some variation of “I will kill all the Titans!” Even then (and has been brought up), more happens to and is shown of their characters in the main series, so the repetition (however slightly) is cut down. Two, the frequency of the characters here compared to the main series is wildly different. In the main series, some of these characters only appear just in the first half or just in the second half, and some of these and other characters are killed off, eliminating them from the anime entirely. In Chuugakkou, nothing horrible ever happens to the characters and they are always around (since they are in the same class and clubs), so their traits are simply present more than usual. So while the lack of depth for the characters can be explained away by the extreme focus on parody and comedy, the repetition cannot. The repetition causes Chuugakkou to lean on the same jokes with its cast time and again, reducing the efficacy of the parody and comedy it strives for. Parody continues with the music employed by Chuugakkou. In particular, the original soundtrack uses many of the same iconic pieces that the main series is known for. Perhaps obviously, the intense and melancholic tracks are nowhere near as impactful when compared to the main series, but they are just as awesome to hear. Plus, they contrast with the everyday happenings and the exaggerated reactions. This contrast adds yet another layer to the comedy, making the show that much more focused. The voice-acting performances are nice in the sense that the actors and actresses who portray these characters in the main series return to portray these characters in this series. Yui Ishikawa, Yuki Kaji, and Marina Inoue reprise their roles as Mikasa, Eren, and Armin respectively to make the main-series fans feel as if they are at the Walls once more. The voice-acting performances are not-so-nice in the sense that the characters do not have many chances to demonstrate their chops. Not as much yelling, screaming, and emotion goes on. They (obviously) sound the same as when they speak in the main series, but the performances simply do not stand out as anything special. The opening theme (as one should guess) parodies the OP of the main series (right down to the subtle glance Mikasa gives Eren). Per usual, this iteration of the OP is not as intense, choosing a much happier and optimistic tone. The end of Chuugakkou’s OP makes this tone quite apparent with its less-than-serious lyrics and upbeat nature. As a parody song, it works. As a standalone song, it does not have the power and emotion to carry itself. The ending theme is reminiscent of Attack on Titan’s second ED, but it does not feel like a parody of the track as the OP does. Following the mood of the show, the piece is quite lighthearted, filled with guitars and drums that seem to erupt from a makeshift garage band. The track does not have any catchy or memorable sections, unfortunately. Combined with its non-parody status, this ED ends up being subpar at best. I am not sure how many of my readers know this, but I am a big fan of the main series. A few reasons make this so. One of the biggest – perhaps the biggest – is Mikasa. Mikasa is one of my favorite female characters in anime, and, in this one, Mikasa was amazing throughout the season. I loved everything she did. Her nonchalant attitude, her incessant need to do everything with or about Eren, and her general adorableness and awesomeness all made me smile and laugh and be happy. Thus, episode three was my favorite. Seeing Mikasa utterly depressed without Eren around, and then seeing her push Jean out of the way when Eren arrived made me laugh out loud. While her main-series counterpart is even better, Mikasa made this anime for me. While I do not like the rest of the cast nearly as much as I do Mikasa, a lot of them were fun, too. Krista being way too cute. Annie’s shyness. Sasha and Connie wanting food and acting dumb. Eren, however, not so much. A ginormous difference compared to the main series makes him a lot less cool, and the difference severely hurts the likability of his character. And, in order to make valid comparisons, this one gave me an easy excuse to watch a large chunk of the main series. Getting to rewatch the main series made me more than happy, but it also made it apparent how much weaker the school setting is. The magnitude and the intensity is a large part of what makes the main series so thrilling, and this one just cannot reach that same level with a bunch of junior-high kids. Mikasa or otherwise. Shingeki! Kyojin Chuugakkou parodies its way to victory. The comedy is focused. The characters, while repetitive in behavior, are reminiscent of their main-series counterparts. And the art, music, and entertainment are strong in their own respective ways. The anime makes it hard to doubt just how clean it is.